Leeds United recovered from going a goal behind to beat Wigan Athletic and return to the top of the Championship. The Latics, celebrating the Whelan family's 23-year association with the club in what is set to be their final game, went ahead through Reece James' fine curling free-kick. But Leeds were level within three minutes when the influential Pablo Hernandez tapped in from close range. Marcelo Bielsa's side completed the turnaround less than a minute into the second half, Kemar Roofe capitalising on a defensive mix-up to walk the ball into an empty net. 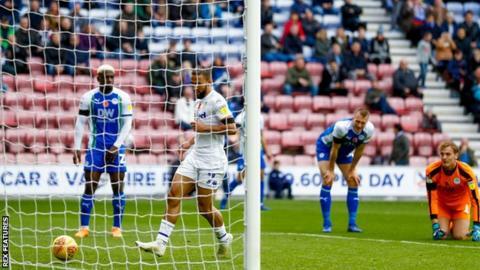 Wigan never seriously threatened to level the contest and Leeds, impressing with their possession-based style, bossed the ball to see the game out with relative ease. Their fourth away win of the season takes them to the summit of the table, leapfrogging previous leaders Norwich City on goal difference. But that five different teams have topped the Championship in the past fortnight only emphasises how tight the division remains - and just five points separate the top eight. It was a day of celebration at the DW Stadium, with the Whelan family set to transfer their controlling stake in the club to Hong Kong-based International Entertainment Corporation during the next week. The takeover will see David Sharpe step down as chairman and he was joined at the match by grandfather Dave Whelan, who first bought Wigan in 1995. Their final game at the helm got off to the perfect start when James scored his first goal since 2016, but once Hernandez equalised the visitors always looked the superior side. United's winner came in comical circumstances when Latics goalkeeper Christian Walton and Cedric Kipre both attempted to clear Hernandez's tame pass - but instead collided in calamitous fashion to allow Roofe the simplest of finishes. "Leeds are an excellent side, make no bones about that, we worked very hard in the game in our pursuit of trying to get a result. "To lose such a key goal just after half time has a massive influence on the outcome of the game. "Leeds had that bit of quality that regularly shone out in the game where we just seemed to lack that bit of confidence or quality when we most needed it." "The fact that we scored immediately after conceding the goal, we neutralised the effect of conceding the first goal very soon. "If we have a look at the aspects of the game, possession, chances conceded to the opponents, chances we had to score a goal, we could play our football, we could impose our style. "The win is very important as we drew at home (last week) so it was important to win the next game to follow the pace we want to follow." Match ends, Wigan Athletic 1, Leeds United 2. Second Half ends, Wigan Athletic 1, Leeds United 2. Attempt blocked. Jamie Shackleton (Leeds United) left footed shot from the centre of the box is blocked. Attempt saved. Pablo Hernández (Leeds United) right footed shot from a difficult angle on the right is saved in the bottom left corner. Assisted by Ezgjan Alioski. Leonardo Da Silva Lopes (Wigan Athletic) wins a free kick in the defensive half. Nathan Byrne (Wigan Athletic) wins a free kick on the right wing. Foul by James Vaughan (Wigan Athletic). Substitution, Wigan Athletic. James Vaughan replaces Darron Gibson. Attempt missed. Callum McManaman (Wigan Athletic) right footed shot from the left side of the box is just a bit too high. Assisted by Leonardo Da Silva Lopes. Attempt blocked. Ezgjan Alioski (Leeds United) left footed shot from outside the box is blocked. Assisted by Adam Forshaw. Callum McManaman (Wigan Athletic) is shown the yellow card. Offside, Leeds United. Kemar Roofe tries a through ball, but Ezgjan Alioski is caught offside. Attempt missed. Pablo Hernández (Leeds United) right footed shot from the right side of the box is high and wide to the right. Assisted by Ezgjan Alioski. Corner, Wigan Athletic. Conceded by Liam Cooper. Attempt blocked. Nathan Byrne (Wigan Athletic) right footed shot from outside the box is blocked. Assisted by Sam Morsy. Attempt missed. Kemar Roofe (Leeds United) left footed shot from outside the box is close, but misses to the left. Assisted by Adam Forshaw. Substitution, Wigan Athletic. Leonardo Da Silva Lopes replaces Kal Naismith. Barry Douglas (Leeds United) wins a free kick on the left wing. Substitution, Wigan Athletic. Callum McManaman replaces Joe Garner.